Blending the romanticism of the Victorian era with science fiction technology, the steampunk aesthetic covers a wide range of styles from apocalyptic and cyberpunk fashions to historical clothing designs. These steampunk heels, steampunk flats, and steampunk boots display the full spectrum of Neo-Victorian design, showing off buckles, studs, fur trim, lace, buttons, and other eye-catching ornamentation. 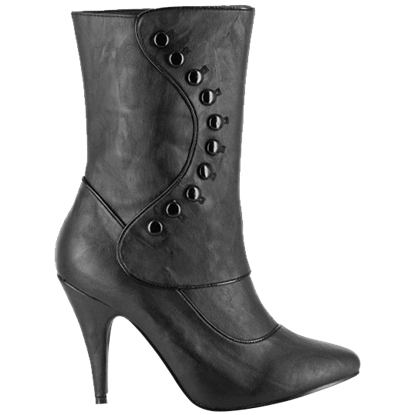 Our womens steampunk footwear includes steampunk shoe types like combat boots, stilettos, pumps, booties, platform shoes, Mary Janes, oxfords, knee high boots, and many more to give you plenty of options when picking out your next pair. 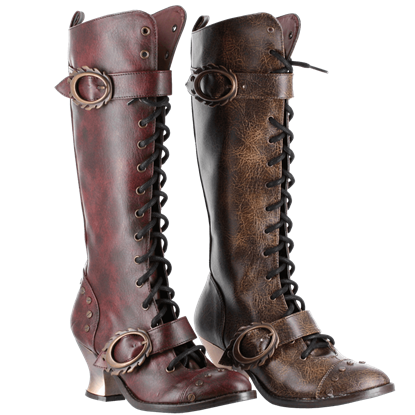 You will look stunning from head to toe whenever you choose a pair of these womens steampunk shoes to finish off your next ensemble! For a ritzy, retrofuturistic look, lace up the Asmara Steampunk Platform Heels. These black sandal heels feature stylish side cut-outs, bold copper colored panels on both sides, and metal heels decorated with rivets and cut-outs. Spikes and leather are always a winning combination. Case in point, just look at these Bjorn Spiked Steampunk Boots. Not only are they eye-catching, but they are a nice accent that you can easily wear with almost any style or look!